Prose Edda is a work without predecessor or parallel. It was designed as a handbook for poets to compose in the style of the skalds of the Viking ages. It is an exposition of the rule of poetic diction with many examples, applications, and retellings of myths and legends. Snorri Sturluson feared that the traditional techniques of Norse poetics, the pagan kennings, and the allusions to mythology would be forgotten with the introduction of new verse forms from Europe. The present selection includes the whole of Gylfaginning (The deluding of Gylfi)--a guide to mythology that forms one of the great storybooks of the Middle Ages--and the longer heroic tales and legends of Skáldskaparmál (Poetic diction). 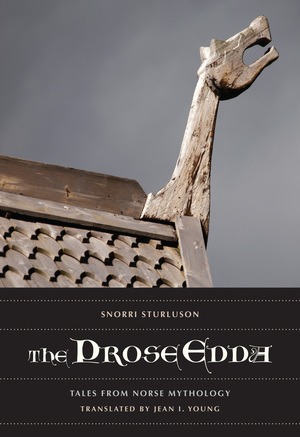 Snorri Sturluson was a master storyteller, and this translation in modern idiom of the inimitable tales of the gods and heroes of the Scandinavian peoples brings them to life again. Iceland's most versatile literary genius, Snorri Sturluson (1179-1241) wrote about poetry, mythology, and the lives of Norse kings. His books include Heimskringla Saga, Egil's Saga, and Saint Oláf's Saga, . He was born in western Iceland, the son of a great chieftain. Early in his career, he won a reputation at home and in Norway for his poetic talents.